This post is written by my daughter Aselefech Evans. Thank you. I assumed that once I (re)met my biological family in 2011, I would feel more complete and sure of whom I was becoming. Some hard questions were answered. And a lot of new ones are on my mind now. I was 6 years old in 1994 when my twin sister and I arrived in the US from Ethiopia. We had memories, and family, parents, siblings, cousins. For years, I had this soft image of my mother, a kind, loving and giving individual who would just about give up anything in the world for her children to be happy and safe. That was the love that kept me strong. 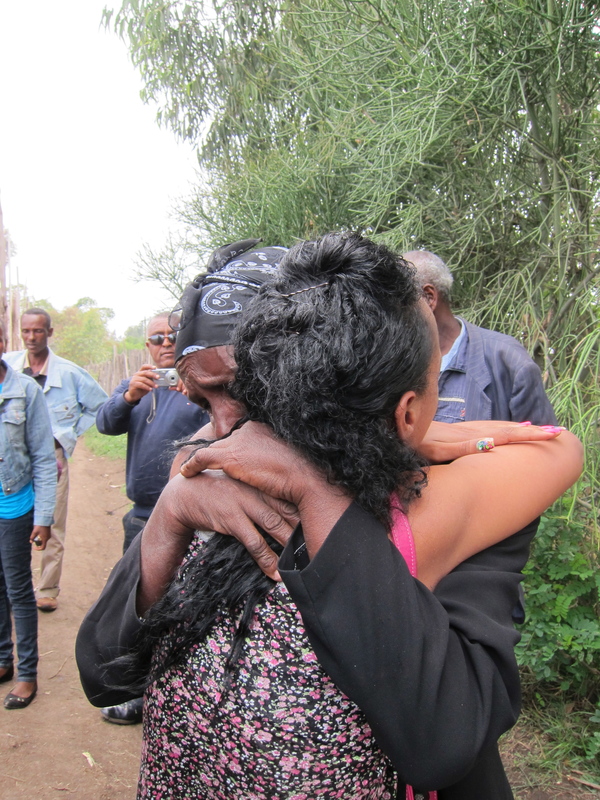 That was the love that allowed me to embrace my (first) (Ethiopian) family when I returned in 2011. See, the thing was that distance never changed how much I love her. Although her face slowly started to disappear as I lost my native language, that tender feeling in my heart for her was always alive and burning. No one could ever tell me that I was not loved nor well taken care of before I came to the US. Because you see, my past says otherwise. I came from a poor family, but we all were rich in the sense of culture, unity, and love. Embracing my mother upon arrival in Ethiopia, and looking into her tired eyes, I saw years of pain, emptiness, regret, and much heart ache. Although in that moment she was happy to see me, the sadness really never left her eyes. In front of me I saw a strong and resilient woman, one who had grown very weary of her circumstances but yet was still hopeful. It’s quite profound that hope and faith during times of destitution and despair are what give certain people purpose and meaning. So where do we go from here? I really don’t know. We can’t change the past. I’m trying to figure out the future, without a common language but with lots of love. This entry was posted in adoptees, Adoption, birth/first family, Ethiopian, Ethiopian adoptees, search/reunion, Uncategorized and tagged adoptees, birth/first parents, Ethiopian adoption, international adoption, love and loss by Light Of Day Stories. Bookmark the permalink. Aselefech, thank you so, so much for sharing. Your experience brings love, warmth and hope to my heart and to so many hearts. I hope that I can support my daughter Meski, 6 years old (though she insists “6 and a half!! !”) in staying connected to her first family in Ethiopia. When I met Meski’s grandmother in Shebedino about 6 years ago she said she sang a little song to Meski (the translator told us), “Always in my heart, always in my heart.” We have to reconnect those hearts in person as well. Thank you so much. Blessings to you always. Wow, so wonderful that you were able to reconnect with your mother after all those years. Thank you so much for sharing your story. Your mom’s blog is really amazing (great work, Maureen!) The issues she brings up NEED to be discussed and change needs to happen. I believe you have connected with my little sister, Annette, also adopted from Ethiopia. She told me your story and I was very moved. I truly hope many other adoptees will have the chance to meet their first families. All the best! Esther, thank you for these kind words! II will pass them on to Aselefech. I very much appreciate your perspective as a sibling. Annette is delightful and insightful–I’ve so enjoyed meeting her. I hope we all stay connected. I have an Aselefech too and have recently found a way to connect with her birthmother who was so confused about what had happened to her. Not about the fact that she would grow up in an orphanage quite away from her, but that she would adopted. She thought she had died which was heartbreaking. Such important work and I hope to follow you along and support you as this takes shape. I am so glad I came across this story.. Im not a adoptee mother.. Im a adoptee grandmother that is taking care of her adopted Ethiopian grand daughter for the last two years.. My grand daughter Selina’s mom and father both died of HIV/Aids . She was sent to her grandmothers, then when they felt they couldn’t take care of her any longer they send her to the orphanage. My daughter has adopted 3 girls from there.. I would love to tell Selina’s story.. But its a long story.. I don’t know how to go about getting it all down and posting it.. Im afraid it would take to long.. But her story is good in the end.. She has connected with Aunts, Uncles, Cousins and a grand mother back in Ethiopia.. And she is planning a trip this Summer after she graduates from High School. So If you would like to here her story to.. Please let me know.. I know the pain of losing the native language, Selina has kept hers.. because I wont let her forget it.. I have her talk to people that are Ethiopian, and she writes all of her school notes in Amharic. We just had a big fundraiser at our church to help her raise the money to go home.. She made almost all of the food, with the help of Our church group.. I loved reading the story.. Please just keep in contact with your mother.. things will work out. Thank you for sharing your story so openly and honestly, Aselefech. My son is not yet 4 and he’s only just beginning to understand his adoption story. Your words also fill me with hope that when he’s older, he’ll be able to meet his BM and family and, as Beth F. writes, “experience this joy & sorrow. Wishing you and your family all the best on this profound journey that is adoption. I too am an adult adoptee who was raised in a transracial family. I found my family of origin when I was 30. I am also an adoptive mother. I know the sadness Aselefech speaks of about her mother, my mother has that same look, even after 8years of reunion. She is overly grateful for the life I’ve been but mourns our loss.. I love both of my mothers with every fiber in my being. I can only hope that one day we find my daughters family and she too can experience this joy & sorrow wrapped into one. Beth, thank you for your powerful words. I share your hope. Best wishes on the journey. You are brave and wonderful, Aselefech. Your story is important and moving. Thank you for putting to words what so many of us feel. Blessings, blessings, blessings to you and yours. Thank you. I’ve shared your words with Aselefech. We wish many blessings to you and yours as well. Very powerful reflection of life, love past present and future, and how u come to grips with choices.How big is your heart. Thank you for your thoughtful words. Choices and love, all tangled together. Aselefech, thank you so much for sharing this. My son’s birthmother’s pain is always with me. I had just written about it in my own blog yesterday. “How can you say that I’m your best mommy when I know there’s another mommy out there who misses you Every Single Day?” I sobbed when I read your posting, sobbed out loud alone in my room, head on my desk, having your confirmation of the loss my son’s Ethiopia mommy must surely feel. My heart is just broken. Karen, my heart is with you. Aselefech’s post was brief, and as you can imagine, there’s lots more to the story. I believe the story is hers (not mine) to tell, when and if she wants to. That said, I’d offer to you that in her story–and in your son’s as well, I’d guess–there is resilience, hope, strength, joy, and healing. Please keep in touch. If Aselefech or I can be of help, feel free to email me at maureen@lightofdaystories.com. Take care. Thank you so much for this, Aselefech. On Aselefech’s behalf (I told her about your comment): You’re welcome, Chris! I dream of this for my daughter and for her birthmother. Thank you for sharing. With you on the journey, Amanda. I believe it will happen. Thank you. I’m crying. My daughter just went through something very similar to what you’ve described. It’s hard stuff. And it’s a big part of the love and loss that intertwined constantly in adoption. Thinking of you and your daughter, hoping we will all continue to talk (and sometimes cry and laugh) together. Wishing you healing and hope along your journey. Kristine, thank you for your kind words. Beautiful and painful–like adoption. I share your wish for hopefulness, for all of us. Take care.